On 8th November 2016 something extra ordinary happened in India when its prime minister Narenda Modi made an unscheduled live television announcement and declared use of all 500 and 1000 banknotes invalid from midnight. At the same time he announced the issuance of new 500 and 2000 banknotes in exchange for the old banknotes. 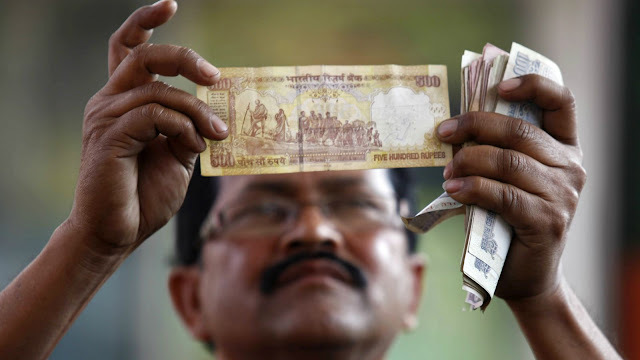 On the face of it the Indian government claimed the demonetization move as an effort to stop counterfeiting of the current banknotes allegedly used for funding terrorism, as well as a crack down on black money in the country.The move is also aimed at reducing corruption, drug menace and smuggling. But the move shows signs which led me to think otherwise and appear to be a mass experimentation in global scale. Lets put this into perspective and context. 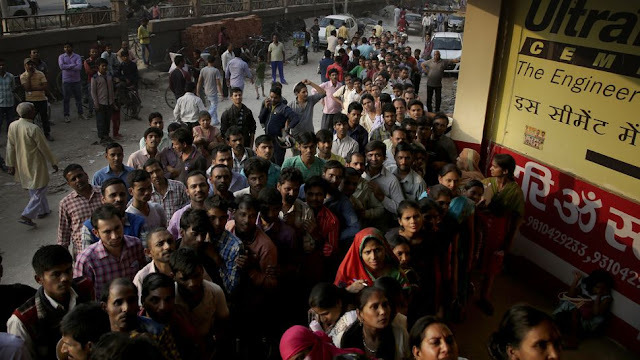 India is a country where 95% of people depend on cash. Less than 2% to 3% people pay income taxes in this country, its the 2nd largest nation on earth and having more than 1.2 billion plus people. With the declaration of 500 and 1000 Rupee banknotes India has abolished 86 percent of banknotes overnight. An estimated 50% of the adult population does not have bank accounts or digital money, particularly in rural India where villagers have little access to bank branch networks or ATMs. Even though this was done in so called secret fashion for mass people, there are signs that the elites and political class was informed ahead of time. There has been some allegation of prior leakage of information about the demonetization. With this sudden move the most sufferer are the common people. People have been queuing up to ATMs and Banks for hours and some all night just to pick up limited cash. The elites have their money in Panama, Singapore, Switzerland or Hong Kong and have been protected but its the rural farmers, the villagers and common daily bread earners who have been massively hit. Very few people are buying the theory that issuing new notes will stop corruption and black money (money from which government did not or could not extort income tax). According to the World Bank, an estimated 270 million Indians live in extreme poverty, so they hardly have any access to bank accounts or fancy credit cards, India is quite prominent in terms of black money. Many within India has called this move the biggest scam in Indian history. If we look at recent time demonetization trend the result is not very optimistic. Countries like Zimbabwe, Myanmar and former Soviet Union did it before. 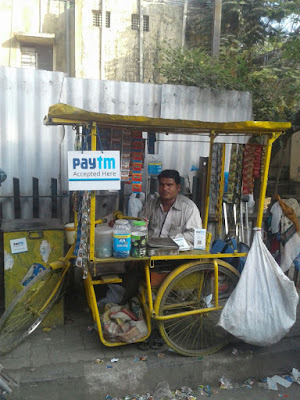 But I believe what happened in India in 2016 is a very new situation and part of a mass scale experimentation to move towards cashless society and completely doing away with cash. From money with intrinsic value (like gold and silver or at least backed by gold and silver) to decoupled paper currency to electronic currency - is what humanity is moving towards and when the monetary system remain in the hand of corrupt bankers and economists this means only monetary oppression and tax enslavement. A number of countries in Europe particularly the Scandinavians have already made cashless attractive and many citizens now don't use cash at all. It may seem that the escape goat is under-the-table money and laundering but eventually this means more power to bankers. Another of Norway’s largest banks, Nordea, has also refused to accept cash in November 2015. It left only one branch in Oslo Central Station to continue handling cash, thus enabling customers to still be able to get cash via banks ATMs. Norway, Sweden and Denmark moving in that direction very very fast. This is an indication where rest of the world will be pushed to. In third world countries still many poor people dont have bank accounts, but bankers don't like it. So demonetization will be taking place through which people will be forced to open bank account because the only way they can exchange the obsolete paper notes (declared illegal by the same government who produce it out of thin air) will be to change via bank. So masses who are without bank account will be forced to get into banking. After the collapse of Bretton Woods system where paper money was decoupled from Gold standard humanity was scammed and the huge amount of real wealth, that is gold and silver was robbed in broad day light. By confiscating the real wealth (gold and silver) what was given was paper currency having no link to Gold and since then any government can print as much paper money as they want and this has devastating consequence to people's life. Money since then has lots its intrinsic value and in a world the labor of humanity which was stored in terms of money was devalued and still being devalued at a rapid rate. So in a sense paper currency without gold standard robs man of his time and in effect his life. Governments can now print money out of thin air and it has become the highest form of black magic for those who reject God and godly ways. The next phase that humanity will be moved into will be money that you can not even see, ie electronic money. We are already in the middle of that experimentation for more than two decades now, but global elites possibly wants to accelerate the process because US dollar and other major currency is about to collapse due to Usury based fraudulent system which is totally unsustainable. Hence moves like India's demonetization likely to happen elsewhere as well. Which this is certainly true and those who are fan of technology will definitely love the idea that everyone should move to electronic money, what we are ignoring is the fact that through full digitalization of money, tax enslavement of humanity will be completed. Indian government very cleverly while issuing new money, reprinted 2000 Rs and many in village for them its useless because no one can give them change. That deception is the most successful deception when the masses can not even guess about it. Indian governments move is a very successful deception because its long terms goal and results are well masked from common people, intellectual discussion and media coverage. Islam is seen as the continuation of the single Divine Way as communicated by Messengers and Prophets sent by God from the beginning of humanity, including Adam, Noah, Abraham, Moses, Jesus and Muhammad. Everyone of these Prophets preached a just system of one God, one human family, one Divine Way. Divine Way is against all form of oppression including monetary oppression. From Islamic point of view, the way in current days tax is collected is a completely oppressive to people and against the Divine Vision. The Divine Vision about tax is that everyone under Divine Governance should pay only 2.5% on their capital (calculated based on past 1 years) and one fifth of their gains or profits will go to government who follow Divine Principles. Every faithful citizen should pay it and there can be no surveillance. Those who do not pay 2.5% on their capital (called Zakat) and one fifth on their profit (called Khums) are to be considered disobeying Divine Law, but Islam do not give permission to conduct audit on their finances. This has to be voluntary and asks all faithful to participate voluntarily and if they do not do so, all their religious activities are void and null and they are liable to God. This money paid to the Government who present Divine Authority on earth are to be used only for the welfare of people. It can not be squandered and or usurp by rulers. This is completely against the religion. Thus when such Zakat and Khums are collected, poverty is erased and such historical precedence exists in Islam. From Islamic point of it prohibit Usury (Interest) and also money has to have intrinsic value (in that sense current Paper Money is Fraudulent and Haram from Islamic point of view), inflation is virtually eliminated from economy activities. Thus the creation of perpetual poverty can not continue and 1% can not hoard 80% of wealth ever. The current oppressive tax enslavement can never be eliminated without adopting the Divine Way about money and monetary system. In our time one of the most brilliant scholar of Islam having expertise in Monetary System and Eschatological Analysis is Sheikh Imran Nazar Hossain. He has been talking about the Fraudulant nature of Paper Currency for sometime now and have excellent analysis that may complement what is discussed here. What we are witnessing around the world from Financial Crisis to Home Mortgate Fraud to Financial Bailout to Too Big to Fail Banks and Perpetual Printing of Paper Money and Taking Out Paper Currency to Bring in Electronic Money are all part of Anti-Christ (Dajjal)'s Corruption of Money. As I carefully observed the media's reaction to India's demonetization it made me convinced that a larger picture at play because given its importance it was given very disproportionate coverage in global news media. This is a tell tell sign of things being well prepared by the global elite. The event caused massive suffering and impacted the life of billions in an important economy of the world and yet so little space was given in media coverage generally means its a designed by the elites and mass suffering doesnt matter to the corporate controlled media. India has been chosen carefully to conduct this experiment for a number of reasons: high unbanked population who needs to be included in banking system and people's easy acceptable of technology. The satanic agenda is to catch all of humanity in the deceptive net of Usury. This idol worshiping (mushriq) nation is a close ally of Israel and with the coming of Donald Trump which according to Sheikh Imran will bring to the end of Pax Americana (American global dominance) and we will start to see Pax Judaica (Israel's role in global stage) unfolding, India and Israel will work side by side in many global policy including one world financial system. This seems one step towards that. Many other nations may follow different strategy in coming days to discourage, ban paper currency, beginning with higher value notes so that people and businesses will embrace electronic currency more and more without complaint. Paper money will increasingly become a liability for many governments. People without realizing will fall in trap of Dajjalic system of more and more tax enslavement where every single transaction will be subject to unjust TAX, VAT and surcharges, so that they may continue to pay out the burden of Usury (God forbidden Interest) and make the rich richer at the cost of common and poor peoples suffering. On 8th November 2016 something remarkable happened in modern day history of humanity. India demonetized 500 and 1000 Rupee notes and I argue here that its a part of a larger experiment to move towards money that you can not see. End result? Yes it will be convenient but it will also mean government will tax your every transaction. This will usher more and more unjust tax enslavement by the satanic systems.